I bought some spare ribs not long ago thinking of making this sweet & sour spare ribs but got caught up with things that I almost forgotten. Saw the packet of ribs again today in the fridge when I was cleaning up the freezer, today it is then, to make this yummy dish. I made Wonton Mee & My Special Gon Loh Sauce few days back with my homemade Chicken Char Siu, a variation of the Char Siu which is commonly made with pork. This Char Siu Chicken turned out delicious and very good looking, the secret to the beautiful red color is my homemade Ang Chow, which is a very healthy alternative to food dye, those who have not tried it, should explore and see! I planted 5-6 varieties of tomato at the back yard this year, they were all growing very well and gave us good harvest. My toddler AS likes to go to the raised bed with colander and collect ripe cherry tomatoes everyday and snacked on them. But then he started getting tired of it so we keep collecting tomatoes and fridge it until it took up most of the drawer space in the refrigerator. I have used the fresh tomatoes in as many dishes as I could think of, yet we still have more than we can consumed! 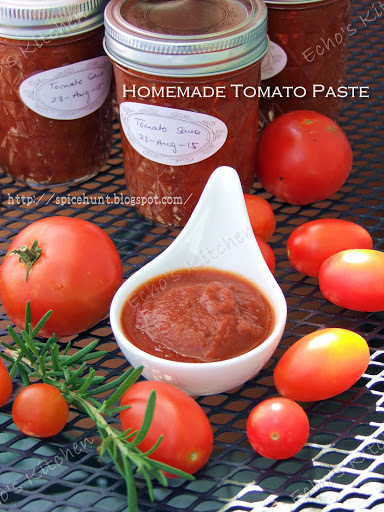 It is high time to make some homemade canned tomato paste! Achar is a classic Nyonya or Peranakan food accompaniment, whoever has visited the historical town of Melaka will not feel foreign about this side dish. One could not forget the experience of having this chilled, spicy, sweet and sour pickled vegetable during hot afternoon. This Achar makes a good vegetable dish and could be stored well in the refrigerator for months. I normally make a couple of bottles and use it whenever I am making traditional Malaysian meals. Many people grow sweet potato at their backyard back in my hometown. Not for the potatoes but the leaves. The plant grows fast and spread like crazy in tropical climates. Many of them have to harvest and share the leaves with neighbors! I plant sweet potato too for its leaves at my backyard every summer. Sweet potato leaves are high in nutrients low in calorie. 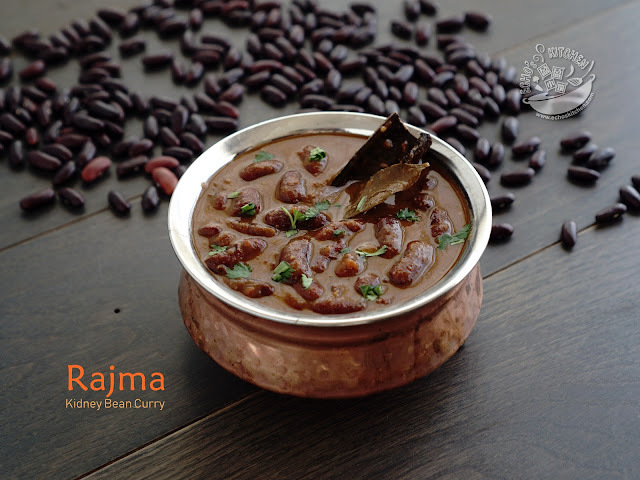 It is also an excellent sources of Vitamin A and C and fiber. The common way to prepare this delicious and healthy vegetable in my home country is to stir fry it with Sambal Tumis, it is a spicy, tasty vegetable dish that goes well with rice! I liked Taiwanese cuisine for a very obvious reason-- it is very close to Hokkien cuisines and relatively light in its seasoning. 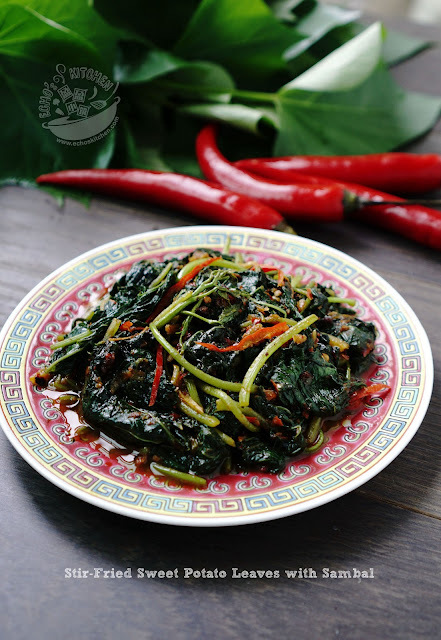 I also like the taste and fragrance of fried shallot and shallot oil in many of its dishes. This Taiwanese braised pork is normally made with minced pork here in many restaurant, the first time I had it with cubed pork was a box given by a good friend Wendy who is originally from Taiwan. Since then, I will take my time to cubed the pork belly whenever I make this dish the taste and texture is simply incomparable. 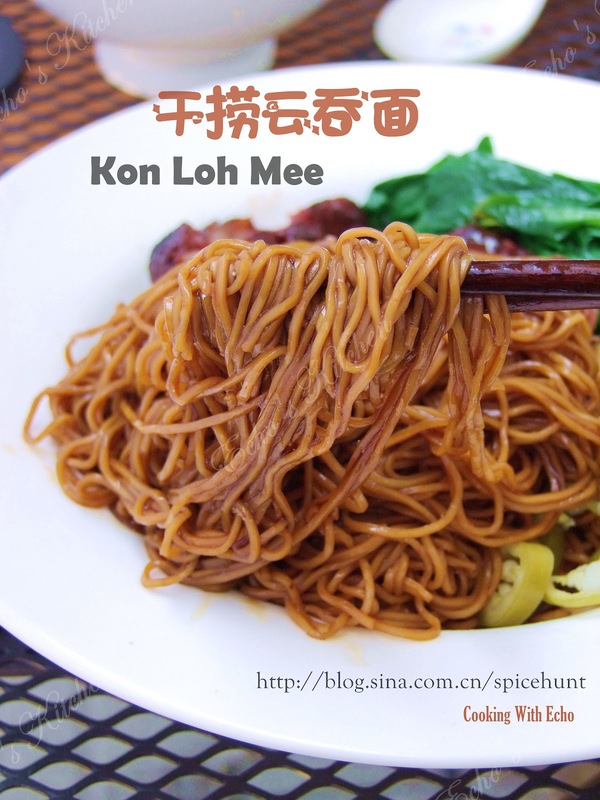 I have also tried many different recipes for this dish after years of trying and testing, I concluded that the best recipe for this braised pork is the simplest of all, just good amount of shallot and a little shallot oil with good soy sauce is enough for give authentic and unforgettable flavour to this dish. Here is my version of Taiwanese braised pork, goes well with rice and noodle, very handy on busy days, have a pot of it in the fridge and dinner could be ready under 10 minutes! When I have egg in whole, I love my egg yolk runny, be it fried or boiled. It is no doubt that this Japanese soft boiled egg that normally accompanying ramen could have my fancy from the day we met, I liked it so much that I will go for Ramen just for the egg! 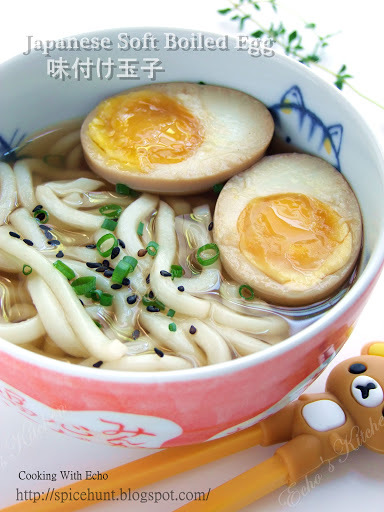 My son AS probably get it from me, he too, loves soft boiled egg, whenever I don't feel like cooking, especially in winter time，I will pick him up from the daycare and go straight to a nearby ramen store and shared a good bowl of ramen with him, with one extra Ajitsuke Tamago. Talking about that ramen store, it is currently closed for renovation, I am really hopeful that they will make it in time to re-open in winter so that I can have my hearty bowl of ramen again! 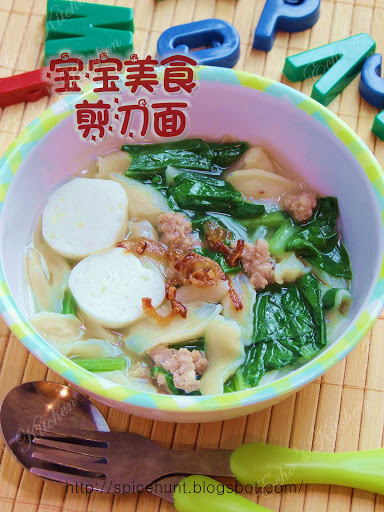 I made this Scissor noodle for Arjun when I made Pan Mee/Mee Hun Kueh, this noodle is made using scissor, much easier to shape than pan mee, and it is just nice in size for a toddler to scoop or handle. He loves this meal so much that he keep pointing to the noodle when I fed him! 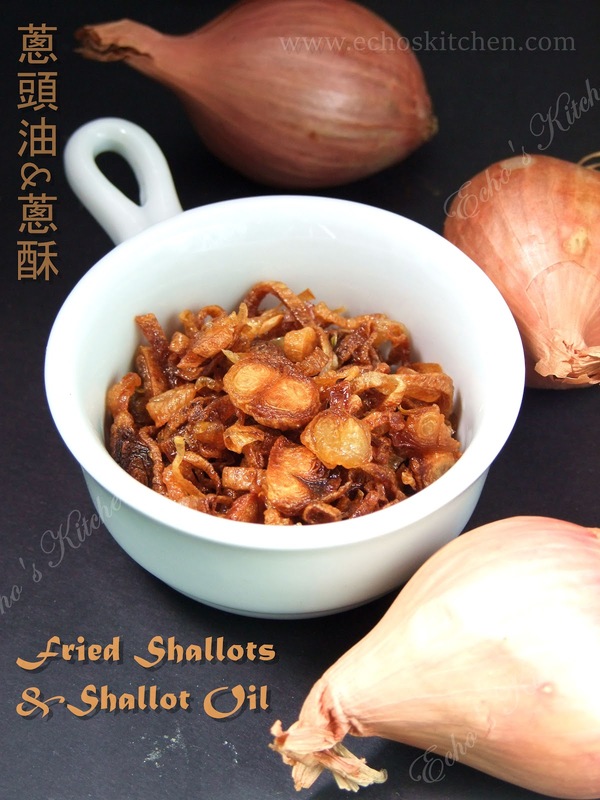 Shallot oil and fried Shallots are two essentials in many of the Malaysian and Singaporean dishes, it was a tradition brought forward from China generations ago by the Min Nan clan from Fujian province. It is so important that many families actually keep a bottle of this oil in the kitchen all the time. 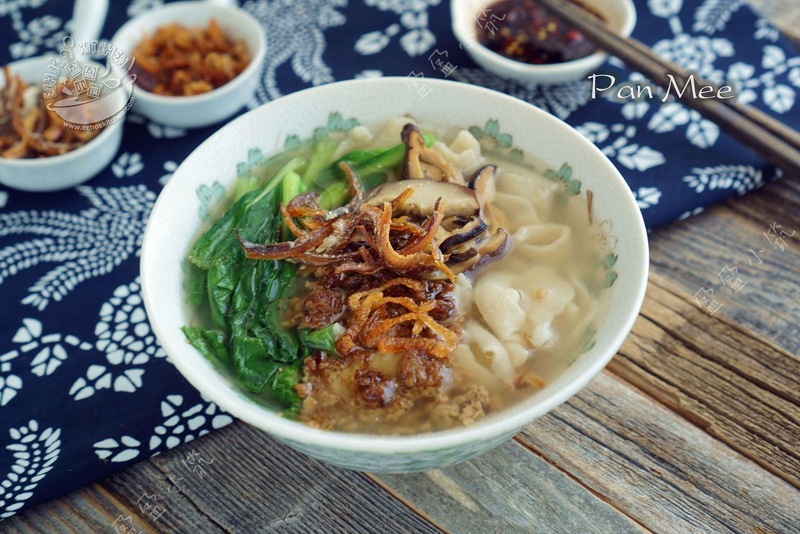 The Taiwanese and Thai too use fried shallots in their cuisine, but they use more of the fried shallot itself and like it crunchy and crispy, thus the oil and fried shallots are stored separately to retain crispiness. We Malaysian used it more for its potent fragrance, thus it is almost always stored together with the oil. I normally make this fried shallot and oil in small batches as I don't need big quantity in cooking. When I do need it in bulk though, I will slow fry it in wok. More often than not, I "fry" it using microwave, it is fast and easy, resulting in same if not better fried shallots!